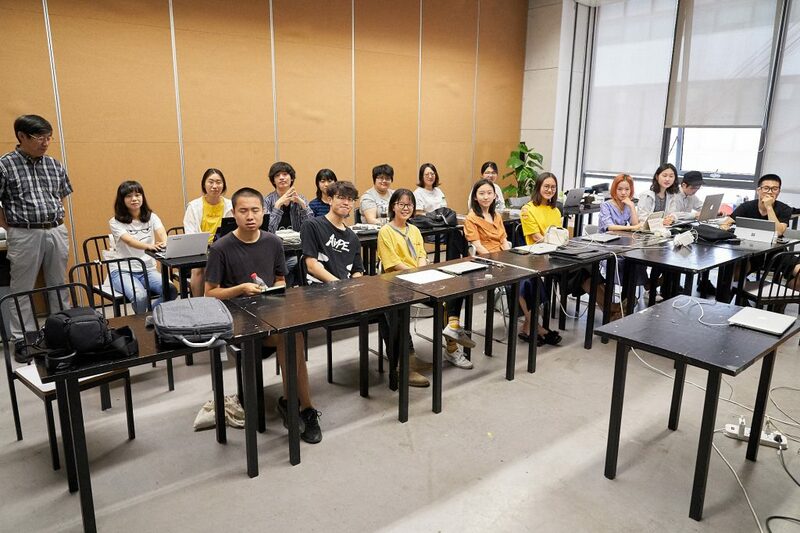 July 25, Wednesday morning, IPRO instructor Dan Chichester and Teaching Assistant Renjie Li deliver a design education lecture to industrial design students at Tsinghua University. The first half of the lecture focused on the contributions to the design field by Professors Charles L. Owen and Vijay Kumar of IIT’s Institute of Design as it laid out the introduction and the development of the Design Context & Process Model, otherwise referred to as the Design Innovation Process Model. At that point Professor Kumar’s book “101 Design Methods” was introduced. It turns out that the students were familiar the book, yet a refresher was given on the “Four Core Principles on Successful Innovation”. So far we had only discussed theory, so a case study was in order. Instructor Chichester then presented prepared slides from Clinical Professor of Design, Tomoko Ichikawa, also of the Institute of Design. These slides, with the inclusion of a few helpful process slides, grounded complex design theory into a real world context. The case study was well received. The second half of the lecture included Doblin’s “Balanced Breakthrough Innovation Model”, and Larry Keely’s “Ten Types of Innovation” system. Both of these models seemed eagerly attended to by the students. Questions were raised about what an industrial designer should know for a successful career. A fair and relevant question indeed. Instructor Chichester delivered his standard answer about design education and the successful designer as a three part study, namely: design field expertise, data gathering expertise of some form, and considerable business knowledge. Teaching assistant Renjie Li had carefully designed each slide delivered with the inclusion of Chinese writing. During the lecture Mr. Li gave near flawless translation into Mandarin for the audiences’ maximum comprehension. The undergraduate industrial design class was very attentive and polite during the lecture. We wish to thank Professors Kumar and Ichikawa for the their tremendous contribution, helping to make this design lecture possible.